For regular cleaning of canvas, double duck and mohair convertible soft tops of all colours, freshening appearance and helping to preserve the soft top's overall condition. THE best convertible roof cleaner! Fabric Soft Top Cleaner removes grime and ingrained dirt without impairing the appearance of the convertible car's fabric and is suitable for all colours. 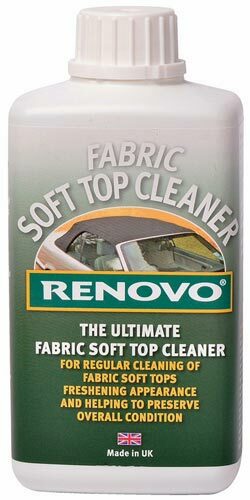 Fabric Soft Top Cleaner is recommended for preparation of the convertible hood before application of Soft Top Reviver and Ultra Proofer. It is especially important to ensure that the fabric is free of grease, dirt and any previous waterproof coatings before using Soft Top Reviver! Ultra Proofercan still be applied with residual waterproofing agents within the material, but it should be thoroughly cleaned with Fabric Soft Top Cleaner to ensure that dust and dirt will not be sealed into the fabric.